This was really easy and totally satisfying. Combine water, wine, 1/2 lemon, bay leaf and a pinch of salt to a medium saucepan and bring to a boil. Meanwhile fill a medium bowl with ice water. When water is boiling, add the shrimp and immediately turn heat to low and poach for 4 minutes. 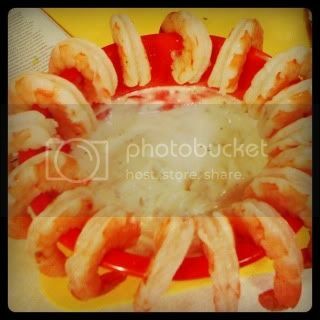 With a slotted spoon, transfer shrimp to ice water. To the poaching liquid, add the juice of the other half of lemon and bring to a roaring boil. Boil for about 20 minutes till there’s only a couple of tablespoons of liquid left. Meanwhile, peel the shrimp leaving the tails intact. Set aside. In a small bowl, combine the sour cream, horseradish, salt and pepper, zest, green onion and 1 tablespoon of the shrimp reduction. Hang the shrimp on the edge of the bowl and serve.